I wrote the Marine Mammal Center and asked for an update on Oreilly, and for a photo if they had one. Here is the photo they sent. Look at those eyes! He has gained eight pounds and is improving. 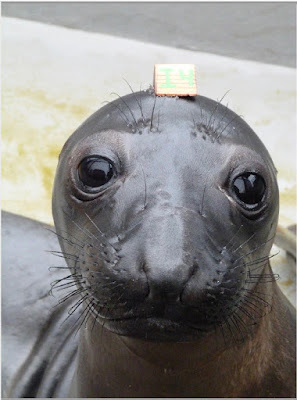 When he first arrived at the center on March 16th, the day he was rescued, there were only 48 Elephant Seals there. Now they have 104. We're still hopeful that he will thrive and survive and make it back to the sea. We cheer for him everyday-- OREILLY!!! When we bought our house in 2015 we hadn't noticed what is now one of our most favorite things about it. It is literally wired for sound. One of the previous owners was a musician and had stereo speakers built in high up in the walls of the vaulted living room. We had an amplifier that we had brought with us from when we were living in Grass Valley. It was easy enough to connect that to the speakers through the inner wiring of the house. We plug in our iPhone to the amplifier and the music plays and fills the house. It is so cool. I hadn't realized how much music is a part of our lives until I read some comments on a fellow blogger's site and saw that people don't listen to music as much as they once did. It surprised me. Music is a part of our daily lives. We have music we love to listen to in the mornings, like Alexi Murdoch's album "Towards The Sun." In the evenings we still like Steve Halperin's "The Chakra Suite" with dinner. It's as mellow as it gets. If we hear a song that moves us while watching something on TV or a movie, I will do everything I can to identify that song. In fact as I am typing this Roger is getting a song we recently heard just a few lines of at the end of the Netflix show "After Life." Sometimes it's hard to decide what to listen to. We do get bored with some of our old playlists. So, lately we've taken to picking a letter and just streaming the songs alphabetically. It's like the best radio station ever! We hear songs we had completely forgotten about, and that will sometimes send us on a whole other musical journey. When I was growing up my parents listened to music often. On Saturday mornings while my mom was at work, my dad would assign my siblings and me each a room in the house to clean. While we did our chores, we always listened to show music. I loved making the beds and dusting the dressers while listening to "I'm gonna wash that man right out of my hair..." or "Some enchanted evening, you may see a stranger..." Music becomes the soundtracks of our lives and memories. Not to be too macabre, but I have a file on my desktop called "Songs To Play While I'm Dying." I read once that our ability to hear is one of the last things to shut down as we shuffle off this mortal coil. I've got a list of songs I wouldn't mind hearing, for instance James Taylor singing, "You Can Close Your Eyes." Nowadays our hearts are pulled by the music of William Ackerman's "Meditations" album, which we stumbled upon because we had been playing the music of the letter "B" and heard "The Bricklayer's Beautiful Daughter." Made us wonder what other music we could find of his. We also recently fell in love with Michael Hedges' "I Carry Your Heart." Want to cry? Listen to that. We love music. Our house is wired for sound, and so it seems are our hearts and minds. What are you listening to? Please share. Ah yes, April has definitely begun with the ferocity of a lion here on the north coast. It's been rainy, blustery, crazy windy, and relentlessly gray. Oh wait, it's supposed to March that comes in like a lion. Hey, April get with the program. You're supposed to be just those sweet showers to bring all those May flowers. C'mon April, lighten up. We're still walking our 3 or 4 miles a day despite the weather. Though on Monday, we're in for a mighty big storm. Don't think we'll manage to get out there at all. We did walk on Sunday and the wind was so fierce I had to hold my hat on my head the whole time we walked. I understood why some hats have ties like a bonnet. It was that wildly windy out there. It has not been a particularly picturesque time either. I think that's the part that disappoints me the most. Any hint of sun, I run out with the camera to see if there's anything interesting happening anywhere. Nope. We did get to see our first Painted Lady butterfly and damselfly of the season. That made us quite happy. The Rufous Hummingbirds are still coming to the bird feeder in our yard on their long journey north. Seems a bit late for that, but we're glad to still be sending them on their way well-nourished. The upside of so much rain is that the aquifers are full... and there are lots of mushrooms everywhere. We take beauty wherever we can find it these days. We keep looking too. Notice how I didn't mention politics at all. That's me being kind, friends, really. Here are some of the views and things we saw this month that haven't been posted on the blog yet. It was a beautiful month. Arum palaestinum (in the Lily family)... it is very stinky! I had no idea a Double-crested Cormorant has blue eyes! I've been thinking about life and death lately. I know, I know... when am I not thinking about life and death? But this has been different, it's also been about the times we are living in: The decline of our planet; the fight about God and religion and borders and war and bombs and money. All of it, everyday.